A new report finds 26 million people were displaced within their own countries in 2007 due to armed conflict and violence. The Norwegian Refugee Council, which has just issued its annual survey, says this is the highest number of internally displaced people ever recorded. Lisa Schlein reports for VOA from Geneva where the report was released. The Norwegian Refugee Council reports 26 million people in 52 countries worldwide were forced to flee their homes and villages last year to escape violence, human rights violations and armed conflict. The report says the countries that produced the largest number of displaced people in 2007 include Iraq, the Democratic Republic of the Congo, Colombia, Somalia and Sudan. It notes more than one half of all IDPs, or about 13 million people, are found in Africa. Secretary-General of the Norwegian Refugee Council, Elizabeth Rasmusson, says in most cases, it is the governments that are mainly responsible for displacing people from their homes. "Governments are displacing people directly through their own security forces in Central African Republic and in the DRC (Democratic Republic of Congo)," Rasmusson said. "Governments are displacing internally displaced people indirectly through irregular armed groups in Sudan, Colombia and India. And, they are displacing people, through implementing policies that directly are forcing people to flee. And examples of that are Myanmar and Israel in the Occupied Palestinian Territories." Last year, the report says 2.7 million displaced people returned to their places of origin. But, when they get home, they face a new set of problems. In post-conflict environments, Rasmusson says insecurity and discrimination prevent sustainable returns. "The worst conditions for return prevail in Colombia, Iraq, Kenya, Myanmar, Somalia, South Sudan and Zimbabwe," Rasmusson said. "And, this includes of course the lack of sustainable livelihood, the lack of services including education and health and also in many cases the lack of food security and the lack of protection." The U.N. refugee agency takes care of protection, camp management and shelter for displaced people. U.N. High Commissioner for Refugees, Antonio Guterres warns things are likely to get worse for internally displaced people because of sharply rising food and energy prices. "First of all because many of the displaced people are displaced to urban areas and nobody is suffering more from rising food prices than the urban poor," Guterres said. "These are the poorest of the poor...Rising food prices, extreme poverty are generating instability, confrontations and they themselves help to trigger war and conflict and generate more displacement." 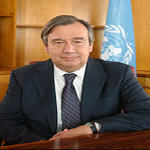 Guterres, says internally displaced people are particularly vulnerable. Unlike refugees, they do not benefit from the protection of international law. Nor do they have an agency such as the UNHCR that is mandated to monitor and assist them. He says governments are supposed to protect their own citizens, but, in many cases, it is the governments themselves, that create the biggest problems of displacement.